The past week's been a wild one for extreme weather – and no matter where you live in the country, chances are you were dealing with something crazy. As we reported earlier this week, California went through it, with torrential rains causing flooding and mudslides and crazy snowfall (more than 6 feet in some regions!) creating a high risk of avalanches. Well, while the East Coast didn't deal with mudslides, this week did bring plenty of snow and a deep freeze, thanks to Winter Storm Indra. About 115 million people were under some kind of winter storm watch over the weekend, CNN reports. And heavy snow, plus freezing rain and negative temperatures lead to grounded flights, downed power lines and – as you may have noticed – cancelled classes. And, thanks to climate change, these extreme weather events aren't likely to get less common – even as most of the country sees warmer temperatures and less snow overall. In fact, a new report published by the National Center for Atmospheric Research this week notes that climate change probably won't limit the powerful nor'easters that occasionally hit the East Coast. In some ways, climate change might make them worse – here's how. Most of the time, when you hear about climate change affecting cold weather, you hear about the Arctic – and how the chilliest parts of our planet are becoming more and more unstable thanks to bigger and bigger ice melt. Or you hear about unseasonably warm winters, with less snowfall overall. And that's definitely all true. Scientists have been studying overall snowfall patterns in the U.S. for years, and found that total snowfall each winter has gone down. If you live in Northern California, for instance, your total snowfall has declined about 1.2 percent per year, the EPA reports. And that decrease in snowfall is expected to continue in the coming decades, leading to less snowy winters overall. Where do Nor'Easters Come In? 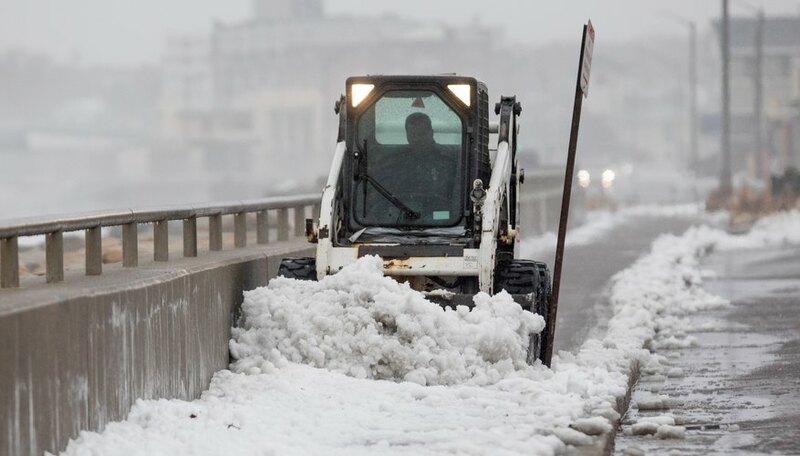 But the National Center for Atmospheric Research report released this week found that the biggest snowstorms, like nor'easters, probably won't follow along that trend. Instead of looking at overall winter weather, the study authors looked at individual snowstorms to pick up trends over time. They found that, while the "snowstorm season" gets shorter as global warming continues, warmer oceans mean more moisture in the atmosphere. That moisture can transform into precipitation (think snow, ice and hail) – so when severe snowstorms do happen, they're likely to be more extreme. So Why Does Climate Change Make Winter Weather Worse? On paper, it seems like climate change means easier-to-deal-with winters overall, right? After all, less snowfall must be easier to deal with than more snowfall. But, unfortunately, that's not the case. Major snow events like nor'easters means there'll be tons of (frozen) water on the ground. Which means that when the snow melts, there's a lot of melting. That greatly increases the risk of flooding when all that snow eventually melts. Add in that the regions hardest hit by nor'easters – like New York City – already face a high risk of flooding because of rising sea levels, and those crazy winter storms can cause big trouble. Ultimately, the research into how climate change affects nor'easters is still new. And the researchers plan to look at how a mix of snowy and rainy weather in winter storms can impact flooding. But their findings so far drive home the importance of addressing climate change all year long – not just in the summer when the heat is the most noticeable. What Are Different Types of Blizzards? Tremblay,, Sylvie. "Got Stuck in the East Coast Deep Freeze? You Can Thank Climate Change." Sciencing, https://sciencing.com/got-stuck-in-the-east-coast-deep-freeze-you-can-thank-climate-change-13716824.html. 24 January 2019.